For many busy families, breakfast is often rushed and on-the-go as kids and parents try to get to school and work on time. But as tempting as it may be to grab a sugar-filled cereal bar (or another bad breakfast choice) or to skip breakfast entirely, which is what many families end up doing, it's worth trying to plan a few extra minutes into your evening and morning routines to make time for a quick and healthy breakfast. That's because research shows that eating a healthy breakfast is particularly important for school-age kids. "Research shows that academic achievement is improved when kids eat breakfast," says Marina Chaparro, a spokesperson for the Academy of Nutrition. "Their brains need fuel. They are metabolizing glucose at a higher rate. They are sleeping more. They are developing. Not eating breakfast means less power reserve in their brains." In short, kids who eat breakfast do better in school. 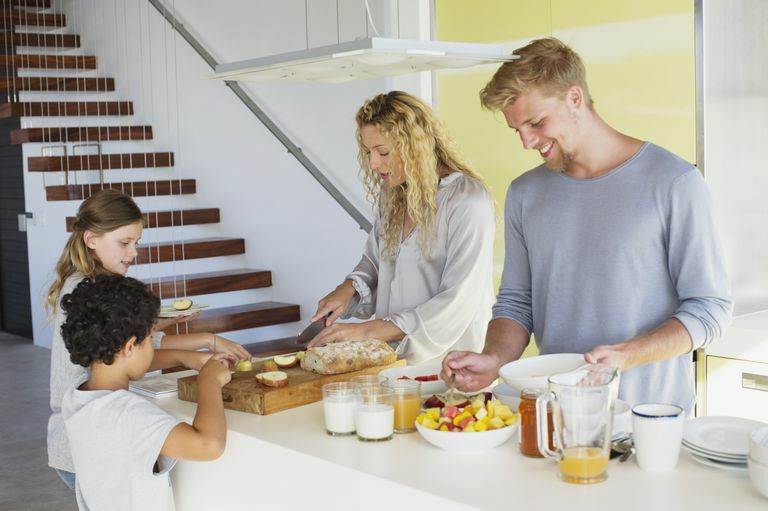 To make sure your kids are eating a healthy breakfast before they head off to school or weekend activities, try these helpful tips and ideas for quick, easy, and nutritious breakfasts. Give them small portions. Another helpful tip: Think quality, not quantity, says Smithson. This is particularly useful advice because parents often don't realize that younger kids really cannot handle big portions. Instead of expecting your first-grader to eat an entire piece of toast, a big helping of scrambled eggs, and an entire banana, for instance, give your child a half-slice of toast, have a few forkfuls of eggs, and eat a few slices of banana to nibble on. Use a muffin tin. A great way to visualize portion size is by filling up a muffin tin cup or reusable silicone muffin cups with cup up cheese, fruit, or other breakfast foods. Make it the night before. As much as you can, make some breakfast items the night before. For example, you can boil some eggs or make some oatmeal and put these items in the fridge for the next morning. Now that you have an idea of what ingredients to consider, try these combinations (or make your own) to create a healthy and easy breakfast. The best part: Many of these quick breakfasts can be made the night before to save time in the morning. And try additional ideas for brain-boosting breakfasts for kids to get them ready for a busy day ahead.